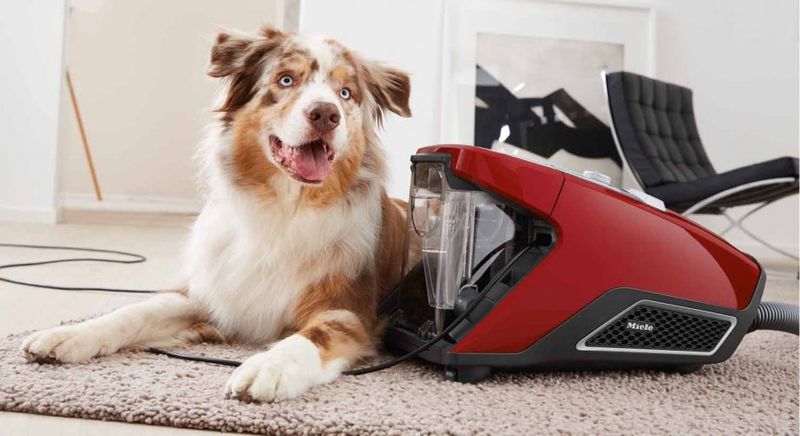 The Blizzard CX1 Cat & Dog Powerline is Miele's first bagless vacuum cleaner aimed specifically at homes with pets. Our experience with a bagless vacuum cleaner years ago left us completely underwhelmed: we felt it was both ineffective and cumbersome. Changing our mind was not going to be an easy task and we hoped this model would be up to the challenge. WHAT IS THE MIELE BLIZZARD CX1 CAT & DOG POWERLINE? We would not choose a vacuum cleaner solely for its design but with its bold crimson colour finished with a grey trim and a crystal clear bin at the vacuum’s rear, Miele’s Blizzard CX1 Cat & Dog is a very stylish household appliance. More importantly, it is a well built, practical and powerful bagless vacuum cleaner which is not an easy combination to find! 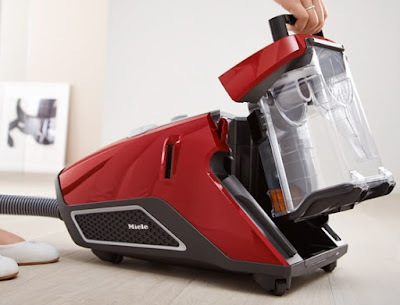 Instead of the traditional Miele hygiene bags, the main innovations in this bagless range are the large (2L) crystal clear bin at the rear of the vacuum with a single, high air-speed cyclone and the innovative self-cleaning filter. 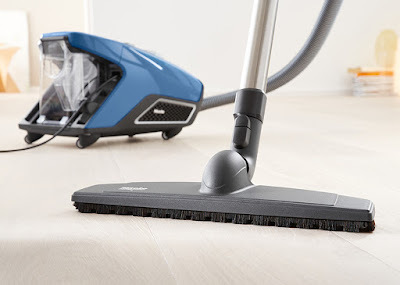 The Miele Blizzard CX1 is designed so there is no direct physical contact with dust at any stage of the vacuuming process, great if anyone in your house suffers from asthma or dust allergies. You need to empty the dust container once the dust reaches the max marking on the clear dust container then simply pull the handle upwards and lift upwards to remove it. Make sure you're right above the bin when you press the yellow release button at the bottom, it will pop open and the contents drop out with ease. Just a word of warning, always check that you close the flap properly afterwards (you will hear an audible click) otherwise it may open inadvertently with dust billowing everywhere! With the bin removed you can unclip and pull out the separate filter canister from the cleaner. Emptying the enormous bin is as simple as holding it over your dustbin and releasing the large flap. Finer dust particles and allergens are captured by a separate filter container, a pleated Gore®CleanStream® fine dust filter which only requires emptying once or twice a year - when prompted by the controls. Automatically following a few cleans - or manually using the Comfort Clean button on the cleaner - small prongs rotate inside the filter to dislodge dust into its canister. You simply open it up and tip out the dust every few cleaning sessions. Inside the main bin is a smaller, finer mesh filter that will also need to be cleaned occasionally. The CX1 Cat and Dog is set on four wheels and it glides easily and quietly on all surfaces but its most impressive feature from the start was by far the suction power, especially when we used the dedicated Cat & Dog floorhead tool. This air-powered rotating brush features twin rows of stiff nylon bristles that are extremely effective at pulling dog's hair even deeply entwined in your carpet or rugs. The CX1 Cat & Dog offers four levels of cleaning power, controlled via a rotary knob on the top of the cleaner’s body. The levels are graphically labelled for use on curtains (or other delicate fabrics such as soft upholstery), rugs, carpets and hard floors, in ascending order of suction power. The main on/off and cable rewind buttons are large enough to be operated by foot (no need to bend down!) and the 6.5m cable rolls all the way back in with a single press. The CX1 Cat & Dog comes with Miele's usual great choice of tools and accessories. The only missing tool is the giant Parquet head and electronic control handle available with the flagship Blizzard Comfort model. All of the tools, the flexible hose and the steel telescopic tubes are well designed and built to last. In particular, the tubes are robust, if not light, and extend with ease thanks to a large collar that releases the clip mechanism. The CX1’s curved handle allows the hose to exit underneath and rotate. Both features are designed to reduce wrist strain. It’s fitted with a good-sized, pull-down dusting brush. It’s a neat design, but the integration into the handle does mean the brush can’t be used with the tubes for long-distance dusting. For that you’ll need to use either the crevice tool or the small upholstery brush, both of which are stored on the rear end of the cleaner’s body. 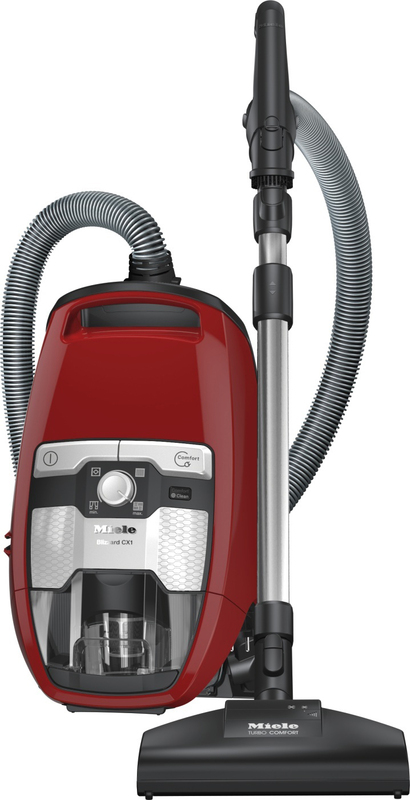 Miele’s excellent EcoTeq floorhead is supplied for general cleaning duties across hard floors and carpets. It’s a decent size without being unwieldy, glides on large rollers, and has a fully articulating neck so can be steered with ease. A foot-operated switch on top changes between carpet and hard-floor duties. HOW DOES THE CX1 COPE WITH PET HAIR? The winning feature is without doubt the Cat & Dog floorhead that removes all this pesky pet hair from your floors and rugs. This mid-width head is quite deep back-to-front and integrates an air-powered turbo brush bar. This nylon bar has two rows of stiff bristles to loosen pet hairs and other debris from carpets and has two speed controls. These are selected by using the slider-switch on top of the head, which diverts more or less air over the brush’s turbo fan. A panel pops off of the base of the floorhead on two coin-turn clips to facilitate easy cleaning of the brush bar. In a single pass with this dedicated head our rugs in the main living areas were left extremely clean and clear of hair. Most of the time, there wasn’t even a need to go back over the same spot on the backstroke. Despite its powerful 1200W motor, we found the CX1 Cat & Dog was extremely quiet even when using the Cat & Dog head on its fastest setting. Despite impressive suction power which means the floorhead will clamp down on your carpet on its highest power setting, we found the CX1 was still easy to manoeuvre across our carpeted areas and rugs. When using the Cat & Dog floorhead, the beating action of the brush bar agitates dust and dirt free from the carpet pile, which makes for a deeper and more effective cleaning of carpets and rugs. For our main living areas (tiles), we used the other floorhead with similar great results. Going up and down stairs in multi-storey house, we definitely felt all 8kg of the CX1 (not a small footprint compared to our Miele Compact C2 Cat & Dog) but we'll save on gym membership fees! However the long tubes and lengthy handle come to the rescue. You can reach a fair way up a flight of stairs with the cleaner itself safely at the bottom or at the top and the 6.5m cable is long enough to be always within reach of a powerpoint. 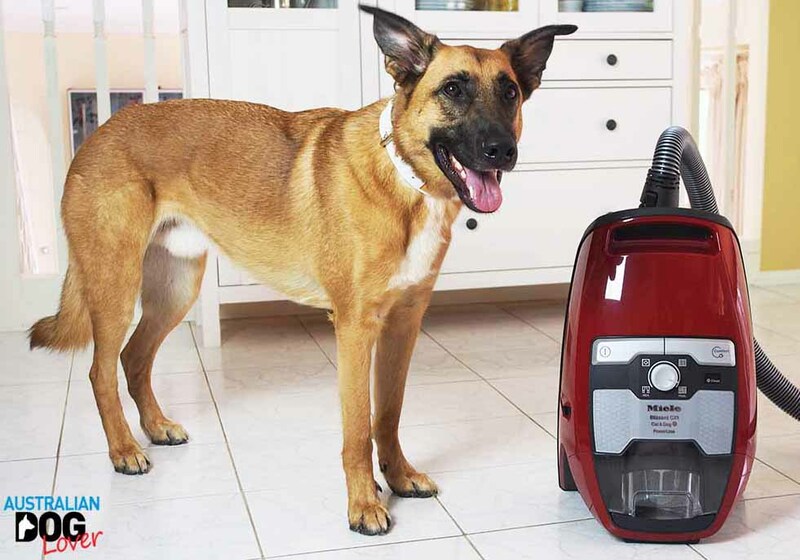 SHOULD YOU CONSIDER BUYING THE MIELE BLIZZARD CX1 CAT & DOG? This is now the third Miele vacuum cleaner we've trialled in the last 7 years and we can't fault the efficiency or durability of our previous models as they still work fine however they now look outdated in comparison! 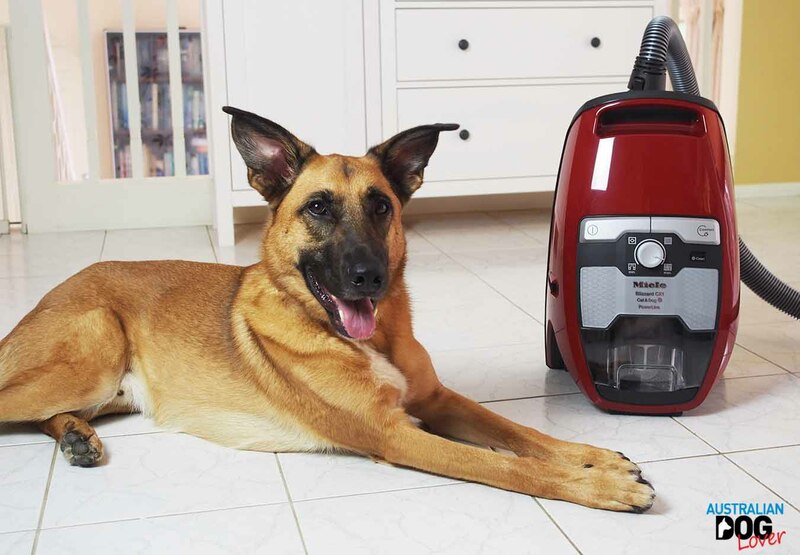 Without a doubt the Blizzard CX1 Cat & Dog is the best performing model when it comes to thoroughly clean a house full of pet hair thanks it powerful yet quiet performance. RRP: $849 nationally from Miele Authorised Retailers, Miele Experience Centres and the Miele shop online. Other models in the Miele Blizzard bagless range include the Excellence model ($699), Multifloor model ($799) and Comfort model ($949). Disclaimer: Product gifted by Miele Australia for editorial consideration.